Whether your company prefers travel and transport by truck, rail, air or barge, Jefferson City offers a variety of efficient, cost-effective transportation solutions.A primary business hub in central Missouri, Jefferson City offers excellent transportation access by highway, rail, air and river. Low shipping costs and the ability to drive to either coast within two days in an advantage for companies who serve a nationwide or global customer base. U.S. Highways 63, 54 & 50 intersect in Jefferson City, making transportation via these major routes immediately accessible from all directions. In addition, Interstate 70 is located just 30 miles north of the capital city offering additional convenience for road transport. Highway 50 Partnership - Cole County along with other communities along Highway 50 created a Partnership to fund a study of the implications of I-70 and I-44 reconstruction and to quantify the economic and safety benefits obtained by upgrading Highway 50 to a 4-lane divided highway through the State of Missouri prior to this reconstruction. Highway 179 Study - To assist with the further development along Highway 179, the chamber spear headed and funded the study necessary to show that a new interchange would be needed along the 179 corridor for the St. Mary's Health Care expansion and future development along that stretch of highway. Jefferson City Memorial Airport routinely serves corporate and governmental flights. The airport is located in north Jefferson City with easy access from U.S. Highway 54. Columbia Regional Airport is located 17 miles from Jefferson City and offers daily flights that can get you to more than 90 non-stop destinations or more than 1,000 cities in 160 countries. St. Louis Lambert International Airport is located 120 miles east of Jefferson City. Lambert has 88 gates, regularly serving six major airlines, 7 commuter airlines, four on-site cargo airlines, and two major charter companies. Airlines, including Air Canada, AirTran, American, Continental, Delta, Frontier, Great Lakes, Midwest Connect, Northwest, Southwest, United, US Airlines and USA 3000 fly from Lambert to over 180 cities worldwide. Kansas City International Airport is 2 ½ hours west of Jefferson City and offers non-stop flights across the United States. The airport is host to a wide selection of international airlines and most domestic carriers, including Air Canada, AirTran, American, Continental, Delta, ExpressJet, Frontier, Great Lakes, Midwest Airlines, Northwest, Southwest, United, and US Airways. KCI boasts 66 gates and three C-shaped terminals with parking conveniently located in the center. Rental car, taxi, limousine and express bus services are also available throughout the airport. Day and night, Union Pacific Railroad offers full-service shipping of raw materials and manufactured products. 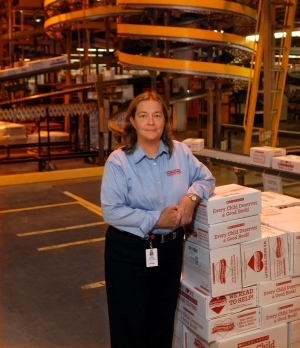 With rail service directly through the industrial park and to other manufacturing locations in the city, Jefferson City's rail system offers a cost-effective method of transporting products to all parts of the country. Amtrak also serves Jefferson City with daily passenger trips to St. Louis and Kansas City. For more information about the rail services available, click here. The Missouri River, which runs through the heart of Jefferson City, offers businesses another mode for transporting goods across the state and beyond. 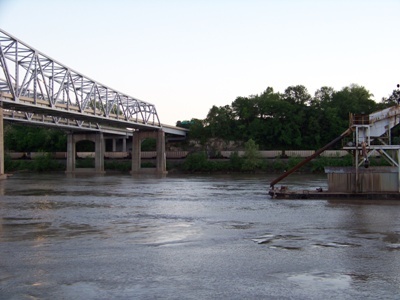 River barges run daily routes from St. Louis to Kansas City, with stops in Jefferson City for easy access loading and unloading.